We eat a lot of corn. More than I’d like to honestly but I’m not the only one eating so I don’t always get what I want. Because of that I’m always on the look out to make frozen corn more interesting. 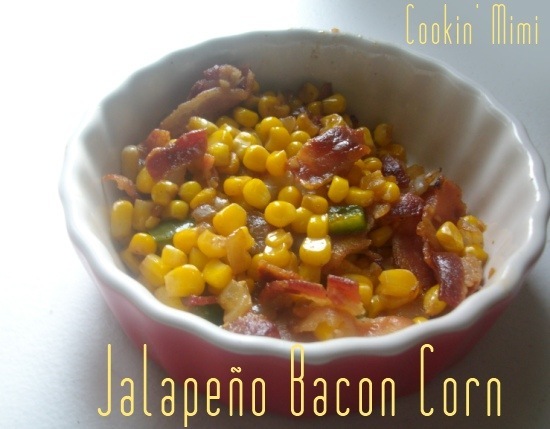 Last year I sautéed corn with onions and peppers and this year I decided to add jalapeño and bacon since I love the flavor combination of the two. Cook bacon until crisp in a large skillet. Set aside on a paper towel lined plate. Drain off all but 1 Tablespoon of the bacon fat. Cook the corn, garlic, onion, and jalapeño in the skillet until the vegetables are tender which will take around 10 minutes. Crumble bacon into the corn, stir, and season to taste with salt. Serve hot. Mmmm, lov the addition of jalapeños and of course, bacon!